Supreme Court Case: Will You Have To Pay Sales Tax On Every Online Purchase? A multibillion-dollar dispute on Internet sales taxes landed at the Supreme Court on Tuesday. The decision could have far-reaching consequences for consumers, states and companies large and small. 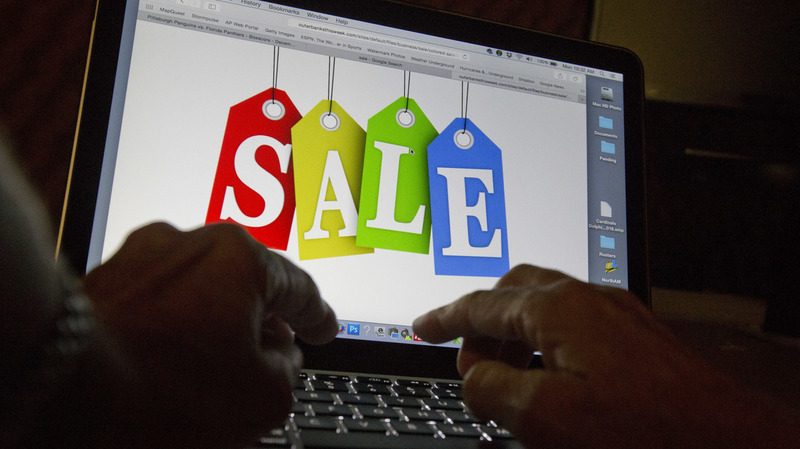 A person in Miami searches the Internet for sales. A case relating to whether all Internet purchases will be subject to sales taxes is heard Tuesday at the U.S. Supreme Court. Going into Tuesday's arguments at the U.S. Supreme Court, it looked as though the court was headed toward reversing a 50-year-old decision that barred states from collecting taxes on out-of-state purchases. But after the arguments, it looked as though a court majority just might preserve the status quo, and that would be a huge victory for online sellers. The case presents a multibillion-dollar dispute, and the outcome will directly affect consumers, cash-strapped states and companies large and small. On one side are states, almost all of them with sales taxes. And on the other are online companies. In this case, retailers Wayfair, Overstock and Newegg. They point out that they, like many other successful online companies, are already paying state sales taxes in an increasing number of states, often because they now have warehouses or stores in many places. Justices Sonia Sotomayor, Stephen Breyer, Elena Kagan, Samuel Alito and perhaps Chief Justice John Roberts all indicated that it might be best to leave the status quo — and the court's precedents — in place, and to leave Congress to deal with the problem of online taxation. That's despite every justice seeming to concede that the court had been wrong in 1967 and 1992, when it barred sellers from collecting taxes on out-of-state sales. But back then, there was no Internet. When Amazon founder Jeff Bezos, at age 30, started selling books online out of his garage in Seattle, he had no idea that Amazon would become the online behemoth it is today. "What's actually happened over the last four years, you know, I'm the most surprised person on the planet," Bezos told NPR in 1999. So perhaps the Supreme Court can be forgiven for being less prescient in 1967 when it ruled that states didn't have to collect sales taxes on out-of-state purchases, unless the seller had a brick-and-mortar presence within the state's borders. By 1992, the justices were getting a little uneasy, in light of the growth of catalog sales. But they reaffirmed the sales tax decision nonetheless. Then came the online commerce explosion. And states began to feel the pinch in terms of lost revenue from sales taxes and mom-and-pop stores being forced out of business. Does Congress want to act? As several justices noted Tuesday, the world has changed since the Supreme Court's two prior opinions, but some noted that online companies have relied on those earlier Supreme Court rulings. Justice Breyer endorsed punting the question to Congress. He pointed to the importance of "preserving the possibility of competition" for small internet retailers. "That's something the Antitrust Division could testify about," he said, "but they're not going to testify here. And so that's the kind of problem that worries me." George Isaacson, arguing for the internet retailers, agreed, arguing that "companies have made their investment decisions based upon a business model understanding" of those prior court opinions. South Dakota Attorney General Marty Jackley, however, argued that states are losing "massive revenue" because local businesses have to pay state sales taxes, but online retailers do not. And that, he said, disadvantages Main Street businesses. Jackley conceded that sometimes activity in the court "will spur Congress to act," as it did in another case. In that unanimous opinion, the court threw out the case of United States v. Microsoft as moot because last month Congress enacted a statute that settled the issues in the case. As Justice Ruth Bader Ginsburg pointed out, eliciting a few chuckles from the courtroom, "We saw from the announcement today that Congress can sometimes act with rapidity." Justice Alito asked, if there were two options — (A) eliminate the old decisions, and states can "do whatever they want" with respect to which taxes to collect or (B) a congressional scheme that deals with all of these problems — which would you choose? Jackley chose option A, because "Congress has had 26 years to address this issue," and it hasn't done it. Justice Kagan noted that it's not as if this issue hasn't been on Congress' radar. But the fact that Congress has "chosen not to do something" might be indicative that it doesn't want to legislate in this area. An old decision rendered "obsolete" by the "cyber age"
Justice Anthony Kennedy, who has previously indicated he was ready to overturn the court's prior cases, waited until late in the argument to speak. But when he did, he pushed back against the "leave it to Congress" solution. He said the prior case, "especially in light of the cyber age," has now been "proven incorrect." Justice Ginsburg also expressed concern that current conditions have rendered the court's old decisions "obsolete" and wondered whether the court should "take responsibility" to ensure its case law is "in tune with current commercial arrangements." Lawyer Isaacson warned, however, that if the court overturns its precedents, immediately allowing states to tax every company, the result would be "chaotic." He noted that although some states have streamlined systems to collect taxes, states containing two-thirds of the national population have not. States often have drastically varying tax rates, he said, whereas "Congress can require one rate per state for all remote sales" or "standard uniform definitions of products." "Somebody get me a bill"
"I was in D.C. about once a month lobbying this issue, and I became increasingly frustrated," said South Dakota state Sen. Deb Peters, who is also president of the National Conference of State Legislatures. She finally lost her temper, she said: "I basically blew up and said, 'I need a bill. Somebody get me a bill.' "
The idea was to pass a bill that required out-of-state sellers to collect sales taxes as a way to challenge the U.S. Supreme Court's prior decisions. The bill passed the South Dakota Legislature, and was invalidated, as predicted by the state courts. That, in turn, enabled the state to appeal to the U.S. Supreme Court, where all indications are that at least some of the justices are ready to re-examine the old precedent. Indeed, Justice Gorsuch once called the current system "a judicially created tax shelter." And, in 2015, Justice Kennedy suggested he was prepared to overrule the Supreme Court's 1967 and 1992 decisions in light of modern realities. Amazon, the biggest of the online giants, is not part of the case. It now collects sales taxes everywhere, but only on direct purchases from Amazon, and not on purchases from third-party sellers, which account for roughly half of the company's sales. The two sides in Tuesday's case agree on almost nothing — not the economic facts, not the amount lost in sales taxes, not even on who is hurt by the court's prior decisions. As Justice Breyer pointed out, "You have wildly different estimates of costs, revenues, and what states are losing or not." Each side contends that the other's solution will annihilate small businesses. Main Street retailers "are getting crushed because their costs are higher than Internet retailers," said lawyer Eric Citron, who represents South Dakota. Small retailers even have a name for what happens. It's called "show-rooming." People come into a Main Street store, ask to look at particular products, and then buy the one they like online because the price is 5 to 10 percent cheaper without the sales tax. Countering that argument is Andrew Pincus, who represents eBay and small business sellers that operate on eBay platforms. He calls the idea of leveling the sales tax playing field a "business killer." "The reality is that these [online] small businesses are just going to go out of business, because they can't absorb the costs," he maintained. In short, his argument goes, given the fact that there are roughly 12,000 tax-collecting state and local jurisdictions in the country, small and medium-sized online businesses will simply not be able to afford to set up the systems needed to calculate sales taxes. Peters, however, counters that "the idea that this is too complicated is absolutely laughable to me because businesses are doing it today." As an accountant, Peters' clients are often mom-and-pop stores. "I set up businesses on software every day where they can collect and remit on their sales," she said, adding, "whether it's in South Dakota or Florida." Citron added that "it's all managed by algorithm." Indeed, 24 states, representing 30 percent of the population have already agreed to a system that that provides the software for free. However, on the other side, eBay's Pincus said the more populous states like New York and California have complicated rules for which objects are taxable, and at what rate. "Just to give a few examples," he said, "in Minnesota blankets are taxable, but baby receiving blankets are not taxable. In Texas, deodorant is taxable, but deodorant that has an antiperspirant is not." The cost for a system that deals with these variations, he said, can be $200,000 up front. While both sides in this debate agree that it would be best for Congress to deal with all these issues, the fact is that Congress has turned a blind eye. And that, for now, leaves it up to the Supreme Court to decide whether it wants to stick with the rule it established a half century ago when the marketplace was a very different place, or not.